BFA Fall Thesis December 1st – 16th at the HECG!! The School of Art at Montana State University is pleased to announce the opening of the 2016 Fall BFA Thesis Exhibition at the Helen E. Copeland (HECG) located on the second floor of the School of Art in Haynes Hall, Bozeman MT. The show will be on exhibit Friday, December 1st to Friday, December 16th. The Public Reception is Friday, December 16th, 2016 from 6:00-8:00 p.m. and will be free and open to the public. Hors d’oeuvres will be served, as well as a full cash bar. On view will be the thesis works of three emerging artists graduating with their Bachelors Degrees in Fine Art. Damon Stevens, Megan Culbertson, and Rosanna Tallon will be presenting in their chosen disciplines of painting, metalsmithing, printmaking. 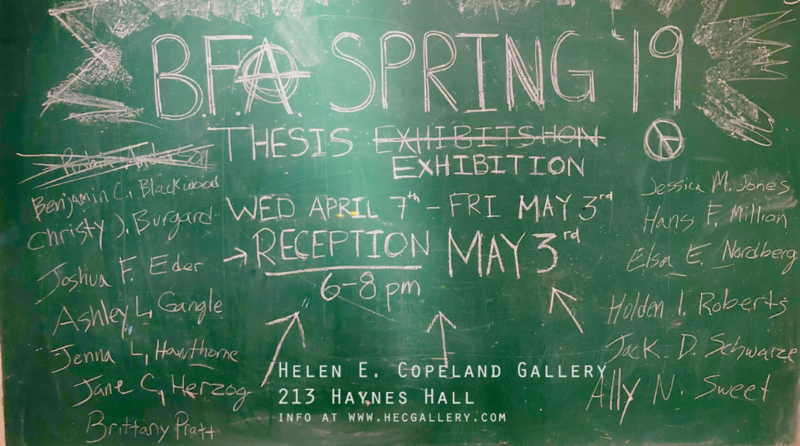 For BFA graduates, the thesis show is a pivotal opportunity to present the culmination of their individual research and works of art created during their time at MSU. It marks an end to academically assigned work, and the beginning of their individual research and artistic maturity. The Helen E. Copeland Gallery is located on the second floor of Haynes Hall. Please note that the parking passes are required for parking during the business day (6AM – 6PM). Haynes Hall is located on 11th across from the duck pond, with the skichair sculpture out front. For more information on this exhibition, or on the Helen E. Copeland Gallery in general, visit http://hecgallery..com or follow us on Facebook (http://facebook.com/msuhecg).